In this post, BPC's archivist, Anne Kumer, shares some history, in this first of a two part entry on the NYC subway trains. 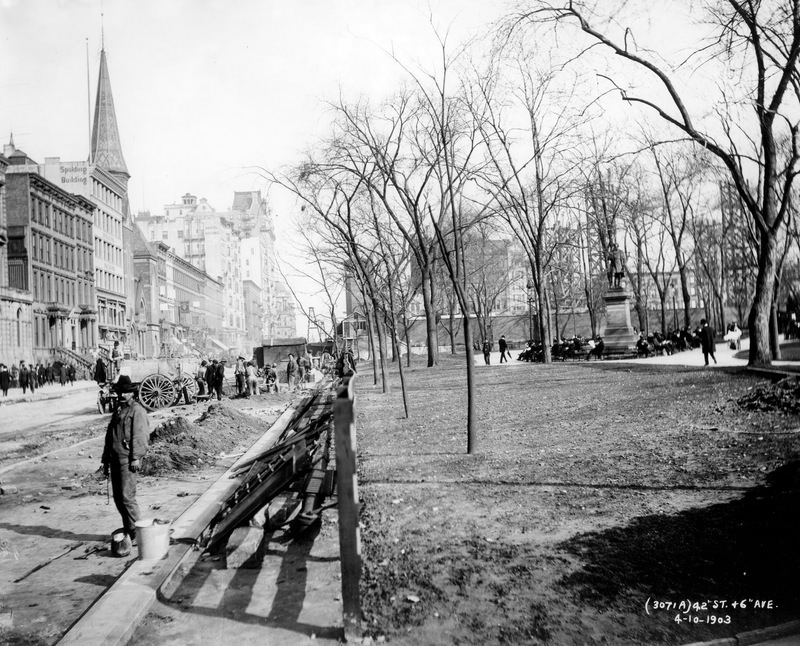 This post also appears on NYC, Circa, a history blog about New York City and its public spaces. It's common knowledge that throughout the city, below ground, there is an intricate subway tunnel system that includes used and abandoned tunnels, passageways, and stations. Mass transit efforts began in NYC many years before the underground subway system was constructed in the early 1900s. The grid system for the streets was laid out in midtown Manhattan in 1807, and the first elevated trains appeared in the early 1870s. With tracks laced across the city, these above ground trains heralded all sorts of urban development, expansion, and helped put New York City on the map as a cosmopolitan destination. In fact, if you ride several trains within the MTA system (full list, I think: 1, 4, 5, 6, 7, A, B, F, J, M, N, Q, R) far enough into Brooklyn, Queens, or the Bronx, you can experience the glory of above-ground transit, except now there is the added annoyance of overheard yelling cell phone conversations from fellow passengers. Not so in the 1800s, though I’m sure those passengers had their grievances too. 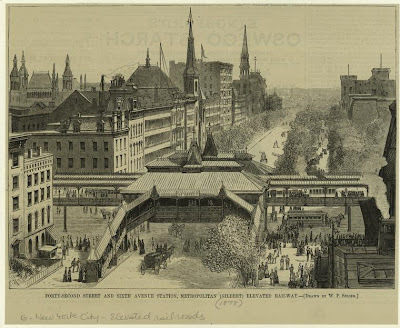 The above image shows the elevated station at Sixth Avenue and 42nd Street, looking east towards Fifth Avenue. The Croton Reservoir is visible on the right, as well as Bryant Park (then Reservoir Square), signified by that clump of trees just in front of the reservoir. The train lines were owned and operated by several companies. The Metropolitan Elevated Railway Company built and ran the Sixth Avenue line; the New York Elevated Railroad handled the Third and Ninth Avenue lines; and the Suburban Rapid Transit Company took care of the Bronx section of the Third Avenue line. 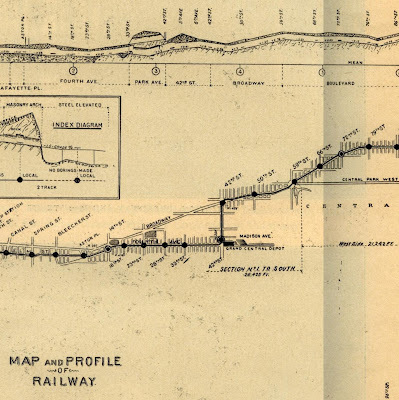 In 1902, a new company, the Interborough Rapid Transit Company (IRT) was incorporated and soon after, built an underground 9.1-mile long line that stopped at 28 stations between City Hall and 145th Street and Broadway. This was the City’s first official subway system, and opened on October 27, 1904, to much fanfare. Part of this line ran along the northern border of Bryant Park, along 42nd street, and connected Grand Central to Times Square (now known as the S Shuttle). The photograph above is a pedestrian-level view of the construction on 42nd Street, looking east, with Bryant Park to the right, and 42nd Street to the left. The monument on the right is J. Marion Simms -- "father of gynecology" -- who now stands across from the Academy of Medicine on Fifth Avenue at 103rd Street in Manhattan. For more historical subway facts, take a look at the MTA's fact's and figures page, and for pictures, check out this NY Times slideshow.